A health care business and a software design company are the first tenants in a refurbished office building in northeast Wichita. Anderson Management Co. bought and refurbished the property at 9229 E. 37th Street North to bring the previously vacant site back into commission. Ross Way, property and leasing manager for Anderson Manager, says KindredHome Health & Hospice and a sister company, Kindred at Home, have leased 6,535 square feet in the building. Arukona LLC, a software design business, has leased 5,060 square feet. Way and Bradley Tidemann, a commercial sales associate for J.P. Weigand & Sons Inc., brokered the Kindred lease. Way brokered the Arukona deal. We’re trying to connect with company leaders of the two tenants for more information. 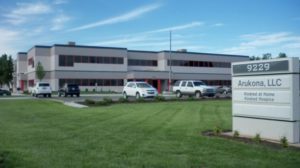 Anderson Management, which manages around 1 million square feet of commercial and storage-unit space in Wichita, purchased the 48,000-square-foot building on East 37th Street last fall. Roughly $3.5 million was put toward property improvements. The building is a complement to Anderson Management’s Northrock Business Park, a mixed-use campus near K-96 and Rock Road that is about 90 percent occupied. Anderson brought back online an office building that had been vacant for the better part of seven years. The building includes 32,000 square feet of office space and 15,400 square feet in the back of the site for an office/warehouse combination. The two-story building, constructed in 1985, was the one-time home of the Center of Innovation for Biomaterials in Orthopaedic Research (CIBOR) before that organization was restructured and moved to Wichita State University.